On November 17, 2011 Guinness World Records Company recognized Tokyo Skytree as the world’s tallest free-standing broadcast tower. 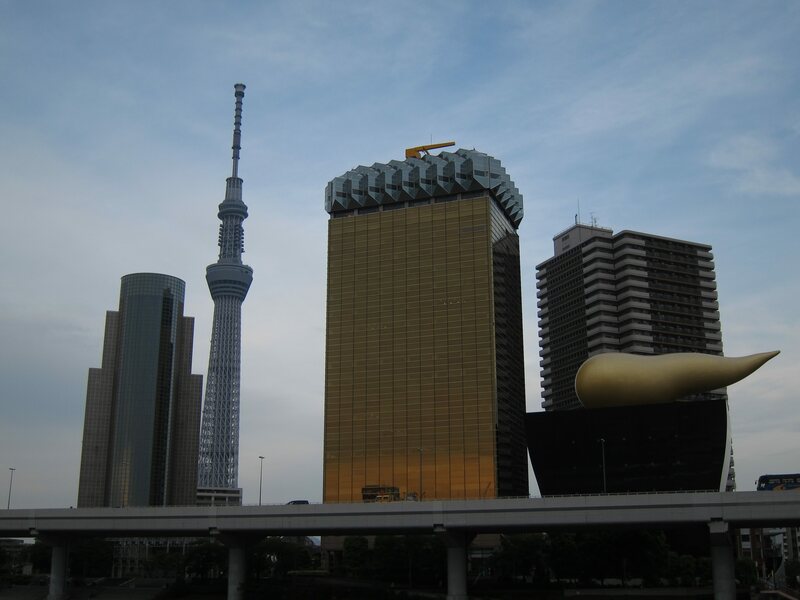 Standing 634 meters tall Skytree is a remarkable addition to the Tokyo skyline. 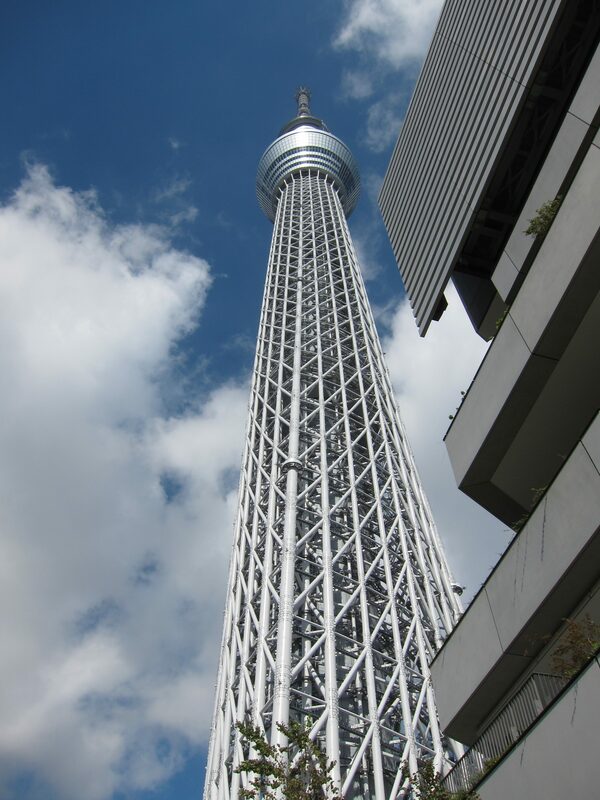 It wasn’t until the end of May 2012 that Skytree opened for viewing. So by now Mr. Cakes and I hoped the frenzy had died down just a tad so we could reach both observation decks. We arrived at Oshiage eki around 7am hoping to avoiding long lines. About 7:10am we were met with this, a 70 minute wait. Believe it or not, that was good news! On another day we tried to get in but were told tickets had sold out for the day. 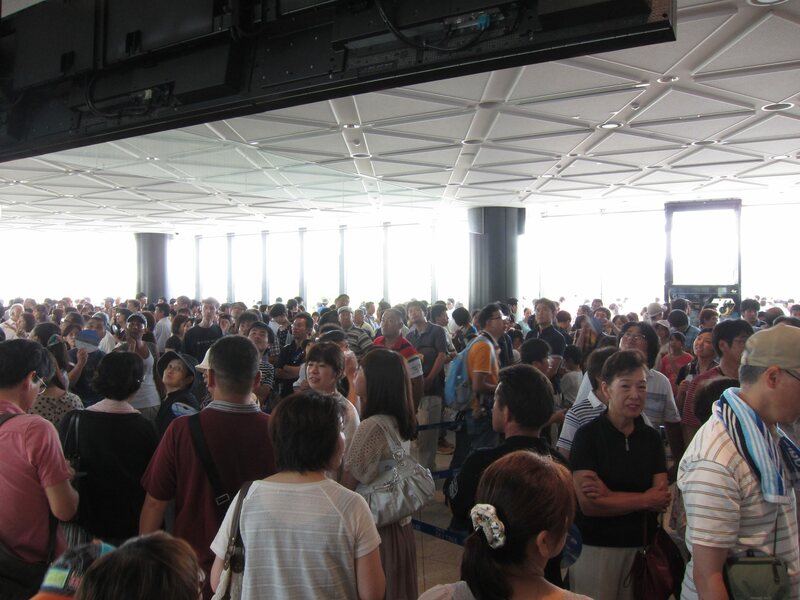 Skytree expects to attract millions of tourists a week, which shouldn’t be difficult! After making it through the line we were then shoved into an elevator that travels from floor 5 to floor 350 in a matter of minutes. Unbelievable speed! 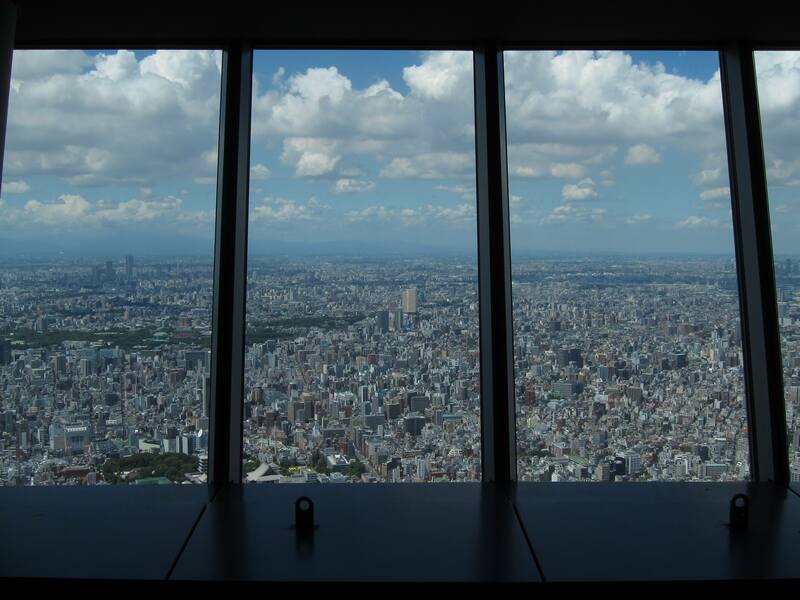 This observation deck stands at 350 meters. Just to compare, the Sears Tower (or Willis Tower) Skydeck is 412 meters high, while the Empire State Building’s outdoor observatory is 320 meters high with an indoor observatory at 443 meters high. 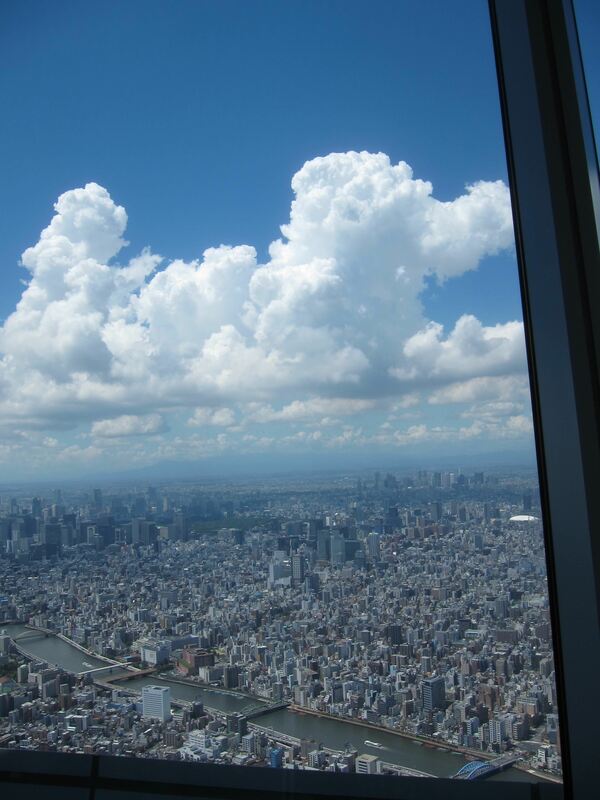 The view from Tokyo Skytree Tembo Deck (Fl 350) could not have been more worth the wait! After savoring the view we jumped in another line to reach the ‘Tembo Galleria’ which is the skywalk at 450 meters high. Stepping onto the 450th floor was exciting! I thought I was looking at the model version of Tokyo. Everything was tiny and well-organized, certainly not the street perspective I’m used to! Seeing Tokyo from such a high vantage point, I realized just how far life has brought me. Mr. Cakes and I couldn’t exactly pin-point our apartment but we certainly realized that in this crazy town of 30 million people we have really made ourselves at home. 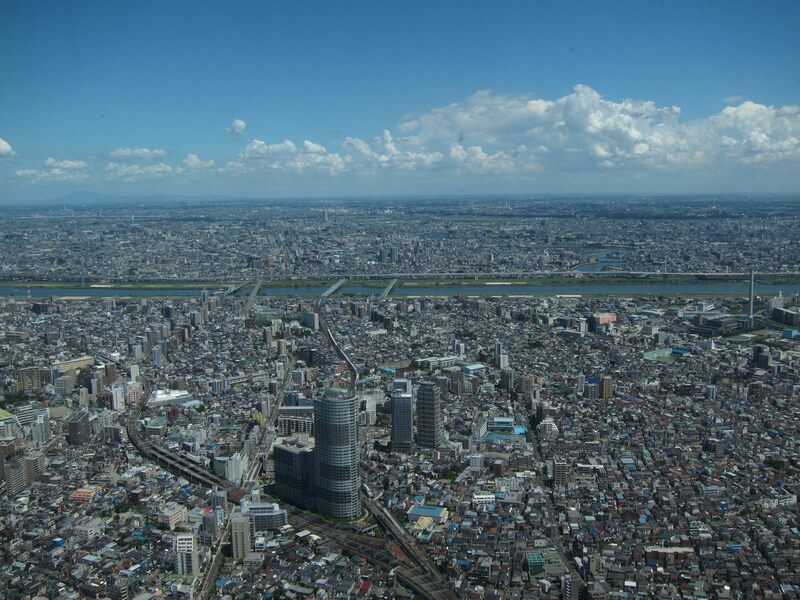 RECOMMENDATION: Go early to view and then enjoy Skytree Town and the surrounding shops in the afternoon. If you happen to be British and find yourself in Roppongi at 6am on a Sunday morning (Burke) I’d suggest you hop on the Hibiya Line towards Oshiage, nap en route, and then jump in line to enjoy Skytree. Afterwards hit the McDonald’s in Skytree Solamachi and prepare for your evening. There are only so many weekends left in Tokyo! 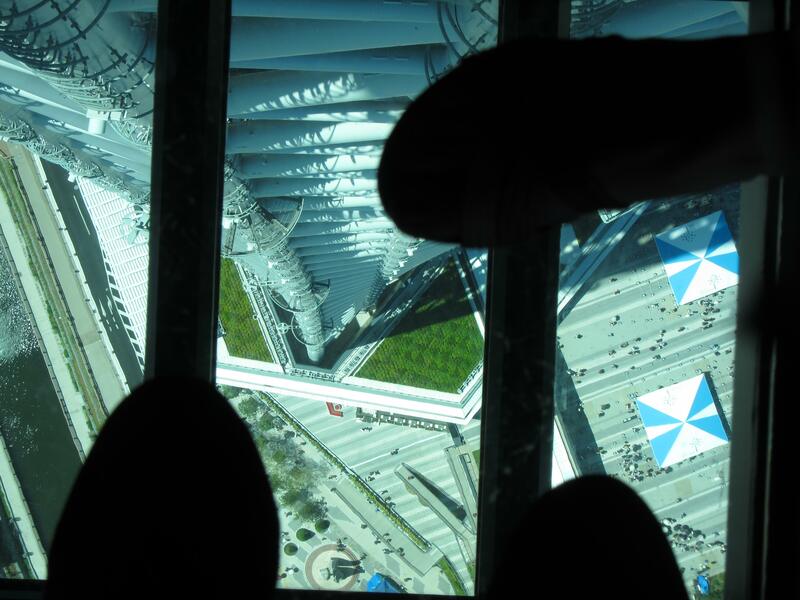 View from the ‘Glass Floor’ on the 340th floor.